A New Jersey collection firm that works hard to turn your overdue accounts into money for you and your business. Business creditors who are owed money by another business or an individual want to speak to the New Jersey collection firm of James S. Friedman, LLC, about converting that debt into available funds. Businesses that have sold goods either retail or wholesale (unpaid invoices, deficiency balances and bad checks). The collection process can be complicated. Account debtors often evade payment of legitimate debts, hide assets, raise false claims concerning the value of the goods sold or services rendered, and seek bankruptcy protection. The New Jersey collection firm of James S. Friedman, LLC, understands that our clients are not really concerned with any of that. Their primary focus is to get paid promptly, maintain cash flow at the highest possible level, and continue to grow their business. Accordingly, we handle the mechanics of debt collection while providing our clients with the information they need to make business-like decisions about particular cases. James S. Friedman, LLC, represents clients at all stages of the collection process including pre-charge off, collection litigation and, if necessary, bankruptcy proceedings. We represent high volume clients with large numbers of collection matters, or clients with single matters. We also handle claims of all dollar amounts. Our clients come from New Jersey, from out of state, and from outside the United States. The firm always strives to tailor its services to accommodate individual client needs and goals. Our primary goals include making sure that clients receive every dollar they are entitled to, and working as efficiently as possible in light of the unique facts and circumstances of any given matter so that clients get value for the expenses associated with the collection process. For example, and depending upon the make-up of a particular case, clients may be entitled to interest, attorneys' fees and collection costs. We labor diligently to include all such sums in the amount claimed from the debtor so as to maximize the monies ultimately recovered. James S. Friedman, LLC, prides itself on not being just another "collection mill". We work hard to get to know our clients, their businesses and their unique needs. The firm does not take a "one-size-fits-all" approach to collection work, but instead develops individual strategies that respond to particular client needs. Our fee arrangements for collection matters vary with the type of case and the type of client. Many collection matters can be handled on a contingent fee basis. In such cases, although the client is responsible for costs, attorney's fees generally are not due until the matter is completed. We also maintain the highest ethical standards, and comply with all applicable collection laws, rules and regulations. This minimizes the possibility of complaints against clients for purportedly "heavy-handed" collection tactics. Contrary to what most debtors may think, we firmly believe that using lawful means to obtain what clients are legally entitled to is not heavy-handed. 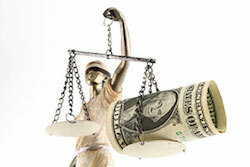 Taken together, the foregoing approach to collection work leads to maximum debt recovery and client satisfaction. If your business is owed money that you have been unable to collect, call James S. Friedman, LLC, at 800-361-6554 (toll free) or contact us online to learn about our services and explore your options.